In Color and B&W, restored from the original 1⁄2” EIAJ masters, total running time – 1 hour, 52 minutes. Jackie’s play “Glamour, Glory and Gold: the Life and Legend of Nola Noonan, Goddess and Star!” was written and originally produced in 1967 and also 1968 featuring Candy Darling and Robert DeNiro in their first major roles on the stage. The play is very derivative of old movies, but is at times both satire and tribute. I videotaped the 1974 revival at the Fortune Theater. It opened to glowing reviews. Critics praised Jackie’s performance as perfectly nuanced. Nola Noonan tastes of fame and is immediately hopelessly addicted (which is really Jackie’s story). One reviewer called the show “a penetrating analysis of what it’s really like to live a dream 24 hours a day, never quite reaching the ring on the merry-go-round”. 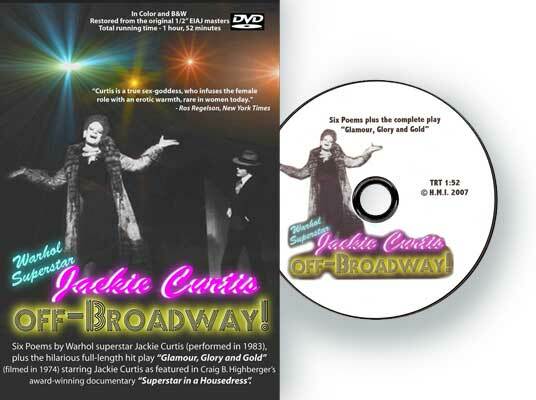 The six poems also included on this DVD were shot in color in 1983, less than 2 years before Curtis’ untimely death and include the highly praised opus “B-Girls” about the denizens of “Slugger Ann’s” (Jackie’s grandmother’s bar).